One thing that almost everyone hears at least once in their life is that they need to “follow their heart.” Need to make a big, life changing decision? Follow your heart! Not sure if the person you’re seeing is right for you? 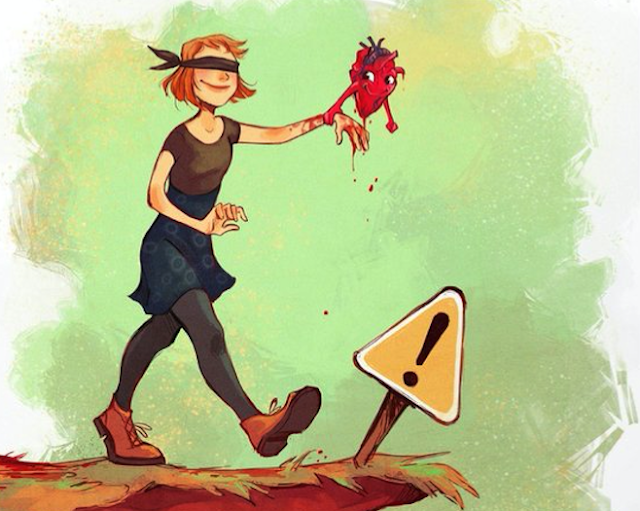 Follow your heart! Trying to decide if you want pizza or double the pizza for dinner? Just follow your heart! It’s easy to say, and it might seem easy to do, but actually following what your heart is telling you is one of the hardest things that you can try to do. In the words of the immortal Selena Gomez (and her team of writers), “The heart wants what it wants.” As trite as that song may be, that basic sentiment is absolutely right. You can’t help but want the things that you want. However, what you truly want, what you crave in the deepest parts of your soul, is the most difficult thing to get. It feels wrong to do what you want to do with little regard for what someone else wants. It feels unnatural and it just isn’t something we’re used to doing. We are taught from the moment we are born to always consider others first (unless the plane is going down), and to put others' feelings before our own. Rarely are we told to indulge in our own dreams, even though we are often given the advice to follow our hearts. It’s just so simple and uncomplicated to follow someone else’s heart. It’s far easier to please someone else than it is to do what you want for yourself. Following your own heart, while a nice idea, can often seem like an act of selfishness. Recently, I read a quote from a man featured on Facebook’s Humans of New York page: “I’ve tried to invest my time and money into other peoples' dreams. I thought that helping others succeed would be an easy way to accomplish something without the pressure of doing it myself.” Stumbling across that quote summed up life just perfectly. It just makes so much sense to help others, to build others up, to make others feel good. It feels so counterintuitive to make yourself feel good, and that is truly unfortunate. I, myself, followed what was in my parents’ hearts and I went off to college. I was the first in my entire family to pursue a higher education. I had watched my older sister follow her own dreams rather than my parents' and it seemed so wrong to me. She did what she wanted, disregarding my parents’ wishes, and I watched how happy she became. Instead of following that path, a path of fulfilling my own desires, I aimed to please someone else. It felt like the right thing to do, but I ended up being miserable most of the time. Now, here I am in the middle of my junior year and I’m finally following my own heart, listening to what my heart is telling me. I’ve taken a year off to see what it would have been like to have paid attention to what it was I really wanted, as opposed to what everyone else was telling me that I wanted. Even though I was studying my passion, and working really hard at it, all I ever really wanted was to explore a life outside of education. It’s been incredibly fulfilling. Even though I’ve been working two jobs since leaving school, I feel like for the first time in my life this is what my heart wanted and I’m listening to it. It’s so easy to live your life through someone else, to do what others want you to do in order to please them or to live by their accomplishments. Once you follow your own heart, though, you realize how much more satisfying it is to live your own life. It’s hard to break away from being a background character in someone else’s big show and become your own one-man extravaganza. But as soon as you decide to be the leading (wo)man by following your own heart, your life comes alive.